It’s hoped that the project will see between 300 to 400 balloons circulating the globe, offering continuous service to a targeted area. One of Google's Project Loon balloons getting ready for launch. 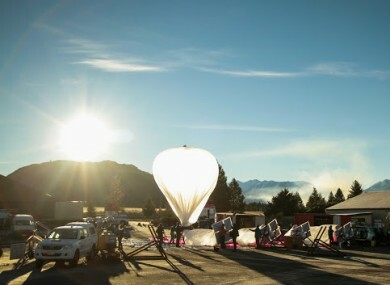 GOOGLE IS LOOKING at getting Project Loon, its initiative to bring internet access to the most remote parts of the world via balloons, operational as early as next year. The project, which just reached its one-year milestone, is working on having real people using the WiFi balloons, according to Wired. The company has recently tested its balloon-powered internet access project in a small community in Brazil, connecting up the local school to internet for the very first time. Over the past year, Google had been conducting test flights for Loon. Clocking over a million and a half kilometres already, the goal for next year is to perform routine flights of 100 days with 100 balloons in the air at once before creating a full ring of between 300 to 400 balloons circling the globe to offer continuous service to a targeted area. The hope is that the project will make enough progress to become operational, most likely in the form of a pilot programme, next year. “On Loon’s two-year birthday, I would hope, instead of running experiments, we’ll have a more or less permanent set of balloons. In one or several countries, you will turn on your phone and talk to the balloons,” said the head of Project Loon Astro Teller. While high-altitude balloons are the main focus behind Project Loon, Google has also invested in other alternatives in case it doesn’t work out. In April, it bought Titan Aerospace, a company that makes high-altitude, solar powered drones, and last week, it paid $500 million to acquire Skybox Imaging, a startup that makes low-cost satellites. While Skybox will be used to improve its maps offering, Google said that the technology used could help improve internet access. Email “Google wants to start beaming internet from its balloons as early as next year”. Feedback on “Google wants to start beaming internet from its balloons as early as next year”.